For some people, the pièce de résistance of Thanksgiving is not the turkey, but the stuffing. Simple to prepare, Bluebird’s Organic Potlatch Pilaf Stuffing with Apples relies not on the high carbohydrate count of typical stuffing, but instead on the hearty foundation of split emmer’s high protein content. It’s also so delicious, so substantial, and so packed with nutrition that you can even serve it as a stand-alone side dish. Great as leftovers, too! Heat a heavy bottom saucepan over medium high heat. Add the oil and let warm for 30 seconds. Add the thinly sliced shallot and cook, stirring occasionally for about 5 minutes, until golden brown. Remove from heat and use a slotted spoon to remove the shallots and place them on a paper towel lined plate to cool. Leave the oil in the pan and return to medium heat. Add the diced shallot, apple, ginger, curry or masala powder, mint and Potlatch Pilaf to the hot oil and stir, cooking for about 1 minute. Add the broth and stir again. Cover the pan and bring to a boil. Reduce the heat to low, and simmer for 45 minutes. For Side Dish: Turn off the heat, remove the cover, and let sit for 10 minutes. 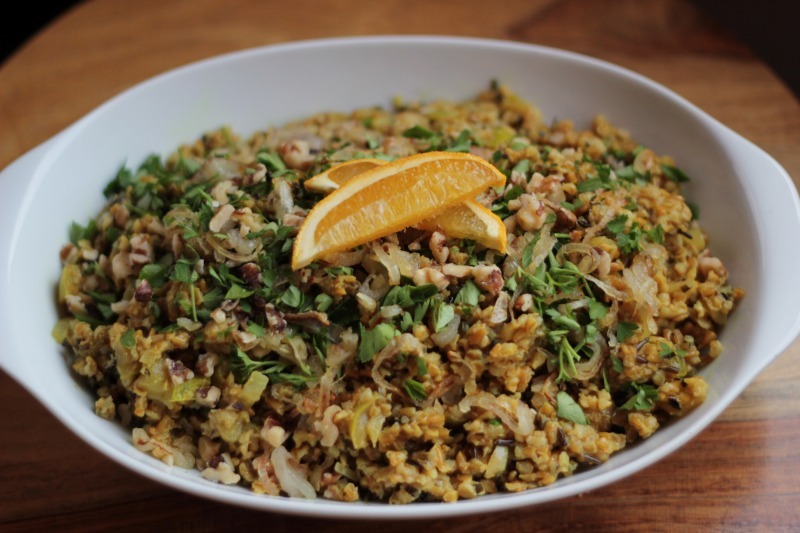 Scoop the stuffing into a dish and top with the fried shallots, parsley and toasted walnuts. For Stuffing: Scoop the stuffing into turkey or squash halves and bake as directed in your recipe. When done, top stuffing with fried shallots, parsley and walnuts.